OLD PARKED CARS. 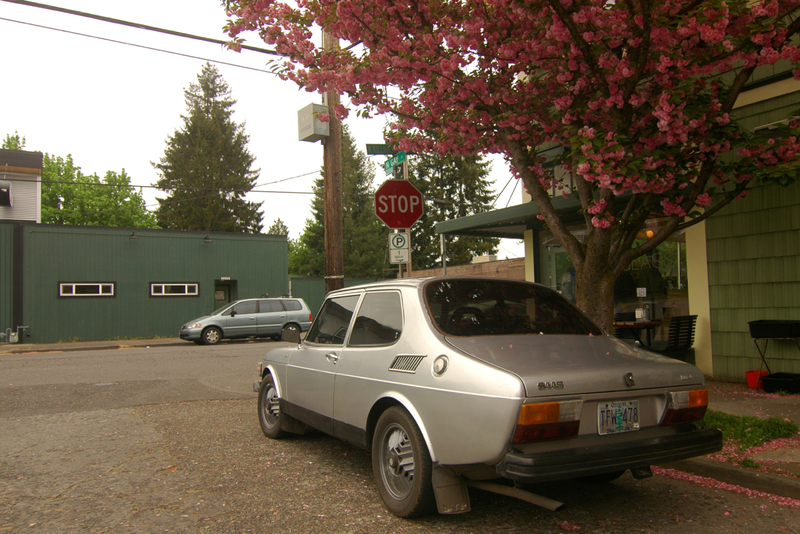 : 1977 Saab 99 GL. A very high score on the Portland hipster meter. Love them old Saabs. Wheels are beyond interesting. They don't mind if you park so close to the stop sign in your town? I knew it was Oregon even before I saw the plate. Concur, hipster. 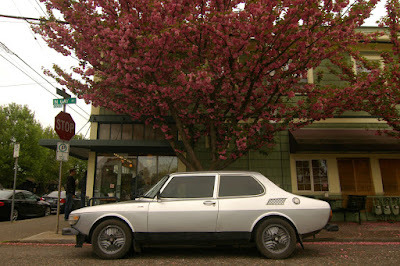 Those would be the SAAB "Aztec wheels". Had the Soccer ball, wheels too. Um, at least 98% of these cars are in Oregon. Way to be astute. HaHa...I live a 1/2 block from here. Was walking my dog in the morning and passed by while the owner was trying to get it started...it took awhile. this thing looks so slick with the tinted windows and black rocker stripe. obviously the quad rounds are a delight, but i love the rear angle, too, the way the lines flow down around the trunk and end with those chunky taillights. someone would lose a lot of forum points for tire size in the "fitment" category. saabs always look great from a 3/4 shot, but the profile is reminiscent of a lumpy,used bar of soap. if i wanted a suitably weird car that was still a decent basis for an engine swap, i would pick an older volvo wagon or maybe a merkur for brand obscurity points. my saab would be the wrx-based 9-2x aero wagon just because of the huge Subie aftermarket potential, even if it means sacrificing 99% of the "soul." 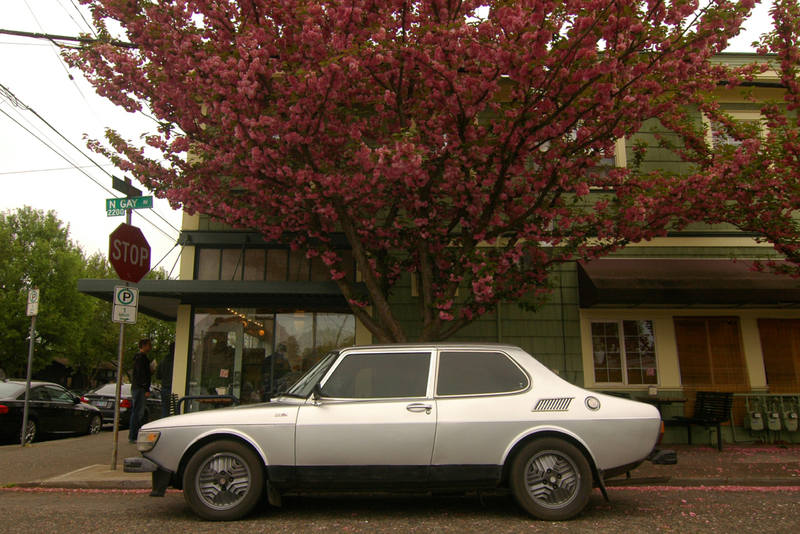 this IS the most suitable hipster car because literally none of the characteristics compare favorably to the alternative in an objective sense, but they still hold enough of the nice-market attention span to justify purchasing one for the notability. This is, in fact, a 1979 (a quick glance at the VIN would have made that obvious). I owned it from 2011 to two weeks ago (two days prior to this photo). non-stock items in photo: Bilstein HDs, Lesjofors Springs, tint, refinished incas, front spoiler ..
Those Toyos got me many miles over the Mountains, on city streets, on rural unpaved roads, and on the track ..
99 is the ultimate SAAB. good luck to the new driver. Good info, J+ipster. Nice car, best of luck on your next ride. If this is a lumpy bar of soap, scrub me clean. I dig it. Tho I would lose the wheels, they're a little too high on the funk meter for my taste. 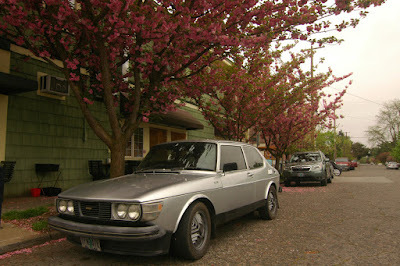 Anyway, the reason most folks enjoy Old Parked Cars is the diversity of the machines. Yes, probably some are hipsters, but most are people who grew up with these cars and can appreciate that somebody out there still keeps them alive. Sorry for the hostility. I don't live in Portland area & hipsters are not welcome in my region. they were rather ruined when i got them so they were refinished - came out a bit darker than I wanted but still O.G. SAAB. I like the composition of the main photo. The way the tree explodes out of the top of the car. A Saab vase. Saabs were reliable cars even here in North, at that time most (similar sized) European cars were used up at 150 thousand kilometers and Saabs lasted 300 thousands. Not a cheap car either, in par with Volvo 200-series but quite popular because of local manufacturing (by Saab-Valmet, in Uusikaupunki). Rims are stock rims indeed, here sold only with 99 Turbo. 99 is and was a sporty car (especially compared to US cars at that time) but it's still meant to be a small family sedan, nothing fancy. Moose-proof, as Saab (and Volvo) liked to advertise: Most cars (or passengers) won't survive the collision with a moose, even now. Here in North a moose is relatively common animal so it's a real safety issue. I doubt also the "hipster car"-badge commenters try to attach to the 99, too hard to maintain and, especially after the bankrupt of Saab, too hard to get spare parts. Serious hobbyists car, basically. And they will get a lot of joy out if it, I know what kind of a car it's to drive. Just an anecdote: To lower the cost, here the 99 didn't have power steering as stock option, so most were sold without it. With 205/60-15 the parking is a gym practise, steering is very stiff. Speaking from experience. I've heard it isn't exactly light even with power steering, but never had a opportunity to try one. It is a rare opportunity for anyone to spot a vintage car such as this precious gem out in the public and to be able to capture it on camera is definitely worth the while. Furthermore, other enthusiasts get to admire even though just on the online platform. It is definitely not on a daily basis that you get to see a vintage car parked on the streets. Such a rare opportunity most certainly calls for a digital capture so as to keep the memories etched in our minds. wow guys, i came back to find a LOT of butthurt reminiscent of the type of jihadist-thinking that motivates small and exclusive sects of people to irrational and violent behavior. perhaps i should have likened the shape to a half-used tube of Preparation-H for your soothing needs? never owned a saab, check. don't need to have owned one to have an "appreciation" for vehicles of this vintage, also check. what do saabs have going for them? a "revolutionary" (for 1966, yes!) drivetrain layout that enhances traction due to ALL of the weight over the drive wheels, but not really much else going for it from any perspective OTHER than your highly subjective aesthetic tastes. apart from Apple products and Linux users, i have to say that you guys are seriously the most zealous devotees to a brand that i have ever encountered. taste is subjective, and opinions are what makes this country - and by extension commentary on blogs - great. i enjoy reading your dissection of my comments, but it's sad that you can't rise above the ad-hominem when making your cases. i'd really like to debate the merits of the saab phenomenon with guys who have a deeper model and brand knowledge, if we could find a common wavelength to communicate on. perhaps a lumpy bar of soap hits a little close to home for those of you who have traumatic memories revolving around communal showers and/or blanket parties wherein a pillow case full of soap bars was the instrument of choice for your aggressors. if that's the case, consider this a heartfelt apology. i also feel like the profile is reminiscent of some sort of amphibious armored vehicle spawned from a former Soviet-era designer's vodka-and-hunger-fueled nightmare. maybe a personal submarine created to escape the austerity and hopelessness of a flawed and bankrupt political/economic situation. maybe just an engineer's interpretation of their toddler's 3-box sedan drawings... regardless, understand that one can appreciate certain aspects of the design, but that doesn't necessarily add up to widespread appeal when you're evaluating the sum of those parts. 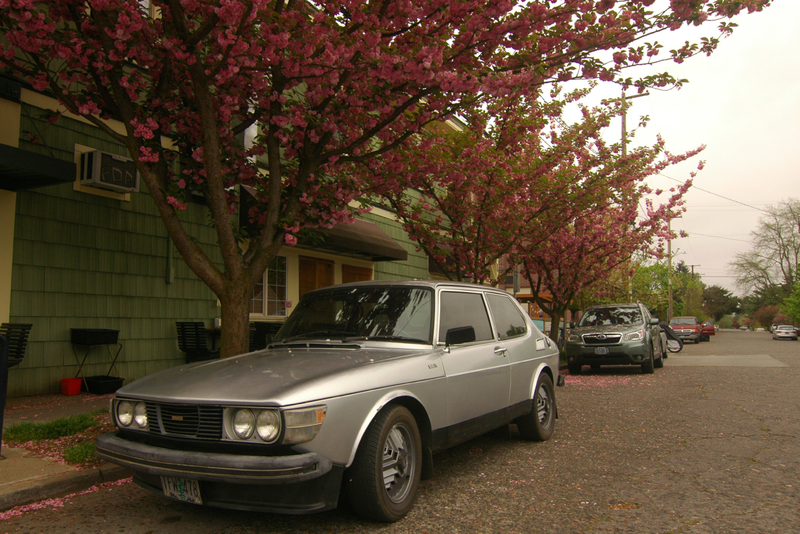 references to the quirkiness of the saab design date back decades; in fact a lot of their own marketing materials reference the unique styling and its eschewing of universal appeal in favor of those of you who "get it," and that characterization seems to embody the "hipster" of today's generation. again - sorry if that offends you, i know for a fact that hipsters hate being categorized like that. if you don't find yourself falling into the "young urban eclectic," you may identify with the older bald spot and ponytail, tweed jacket, progressive slogans on bumpers stickers and yard signs crowd for which i have no convenient term to describe. Awesome. The wheels are elegant.